Haha, just kidding. While marketing has always been (and still is) a driving force behind the Teenage Mutant Ninja Turtle phenomenon, the new movie is far more than just a two-hour toy commercial. This review has been a long time coming. I've been loving this new wave of Turtle nostalgia. The arcade game is up on Xbox Live, new merchandise has been cluttering stores for months, and kids (young and old alike) are once again debating who their favorite Turtle is. You have to be a kid or have been a kid in the early 90s to "get it," but judging by the box office receipts, a lot of people got it, and we haven't seen the last of the turtles in the multiplex. You see, I distinctly remember turning on the TV and watching Teenage Mutant Ninja Turtles for the first time. I was about 4 at the time, and once my mom walked in and caught the name of the show, she immediately picked up the phone and called my dad at work. "Steve, guess what James is watching? Teenage. Mutant.Ninja.Turtles." Little did she know, those four words would be plastered on pretty much everything I owned, just like every other kid at King Street School. We lived and breathed everything Turtles. From the toys to the cartoon to the movies to the video games, we were transfixed. Of course, we grew up, and the Turtles were no longer a part of our daily lives. The Turtles returned to TV in 2003, and while I did catch an episode here or there, it just wasn't the same. The new show was dark and gritty, much like the original comic book on which all of this madness was based. 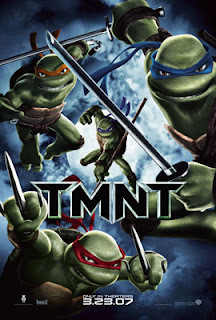 Now we have TMNT which is, above all else, a major throwback to the Turtles my generation grew up with. Sure, they're more grown up (and are twentysomethings now, and never once are referred to as teenagers), but Mikey's still the goofball, Leonardo's the leader, Donatello's the smart one and Raphael is, well, angsty. There's some subtle references to the original cartoon and movies, including Michelangelo's taste for cereal on his pizza, and the relationships between the Turtles are pretty much how we remember them. Long story short, this film is more about the four brothers reuniting as a team and overcoming their differences than fighting the bad guys. Yeah, there's some business with an ancient warlord trying to capture 13 monsters with the help of four stone generals, yadda yadda yadda, but the central conflict here is between the turtles themselves, particularly Raph and Leo. Their tension comes to a head in a fantastically animated rooftop battle, which completely made me forget I was watching CGI. There's some recognizable voices, including Sarah Michelle Gellar as April, Chris Evans as Casey Jones, Patrick Stewart as Max Winters and Ziyi Zhang as Karai. Laurence Fishburne narrates while Kevin Smith cameos as a diner owner. While this film is mostly on its way out of theaters, make it a point to check it out on DVD if you grew up on the Turtles. It's fun, has some great action scenes and it should definitely bring back some fond memories. Your inner six-year-old will thank you.